Have you ever seen grass so green? 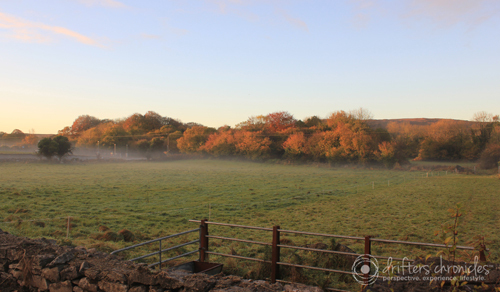 If you wake up early in the morning in Dublin, you can catch the 7 AM bus from Dublin to Galway. From there pick up your rental car and make your way to the Cliffs of Moher. Be sure to have your international drivers license before you go if required. I was chief driver and Andrew was chief navigator. There were a couple of things I wasn’t prepared for: 1) Ireland drives the opposite way from Canada and 2) the roads are very skinny. The roads were very slim and there was no room for error. Basically, the road is just big enough for two cars one each way and a little bit of side grass and stone wall. This made for an interesting drive. Especially with the world’s biggest backseat driver in the passenger seat. Every few minutes I was told to slow down, speed up (too many cars piling up behind me), brake, watch out for the sheep! I mean really!? I’m a great driver. 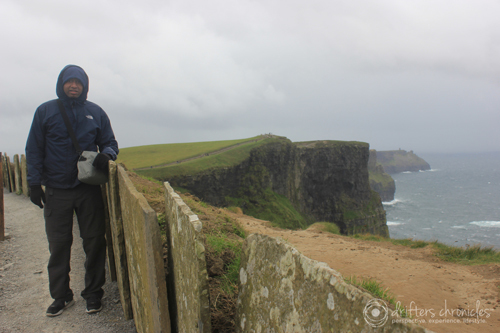 After what seems like a whole day (actually a few hours) of driving, the Cliffs of Moher. It was cold and windy but worth the trip. It was spectacular. This natural landscape actually exists. It is one thing to look at pictures, it is another to actually be there in person. Breath taking. 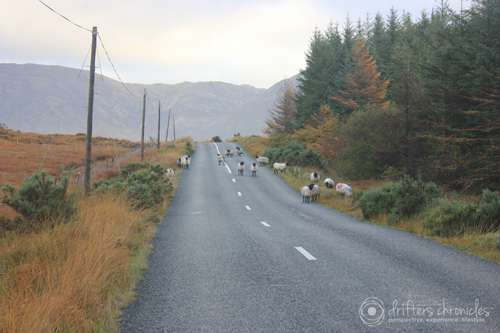 If you wake up early (around 5:30AM), in one day you can visit Kylemore Abbey and Connemara National Park. You can catch the bus back to Dublin in the evening. Keep an eye out for sheep on your drive! Don’t worry as your car moves closer they will move out of the way. Enjoy the beautiful landscape on the drive. Take notice of the sun peeking out over the rolling hills. 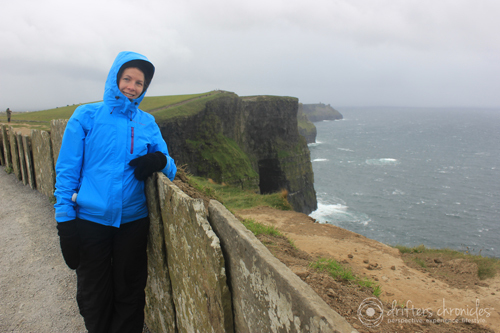 Ireland is a must visit if you love the outdoors, particularly the west coast of Ireland. 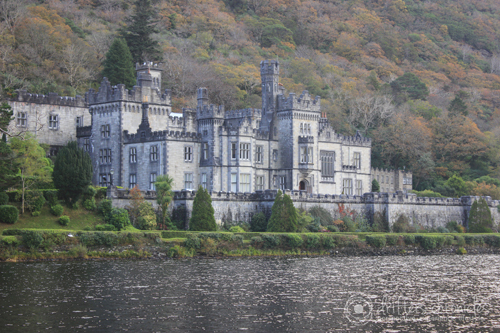 The best part about an early start is you will be one of the first visitors at Kylemore Abbey. In our case, we were actually the first visitors that arrived. This was a great time to take pictures because there were few people. It is known as the most romantic castle in Ireland. Every time I look at this picture I think how romantic the abbey and gardens were to visit. 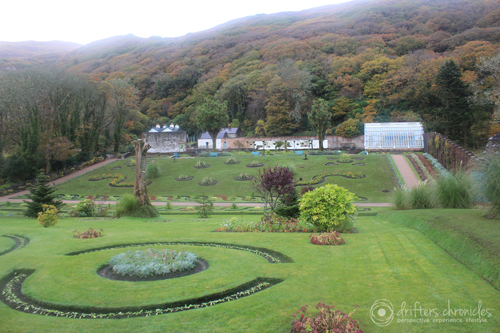 The Victorian Walled Garden was spectacular. It was perfectly manicured. The head gardener’s house was open to walk through. The garden covers six acres of bogland. I love beautiful gardens. 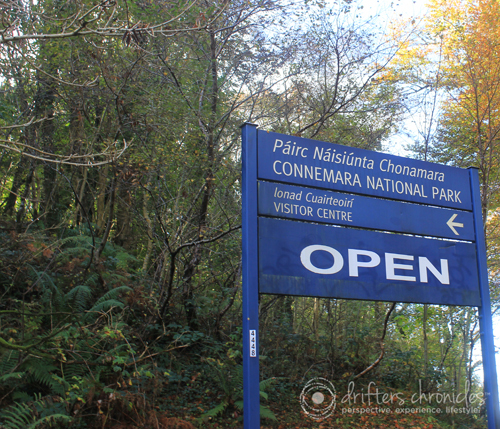 It is a short drive over to Connemara National Park. Our goal was to hike up to the top. It is a good hike up to the top and back. The weather wasn’t that great when we started out. It was cold, rainy and windy. At some points we had to squat down on the ground because the wind was blowing so hard, I thought we were going to be blown off the mountain. We kept trekking up the mountain. When we got to the top, we could see the twelve bends off in the distance. 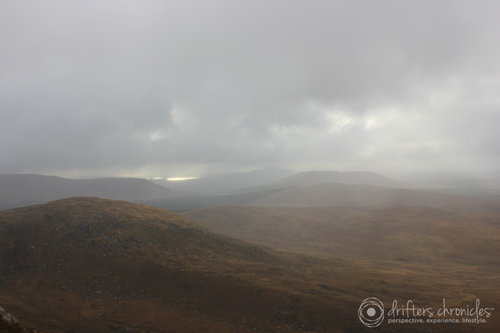 The weather started to clear up at the top of the mountain. You can even see a little rainbow in the clouds. 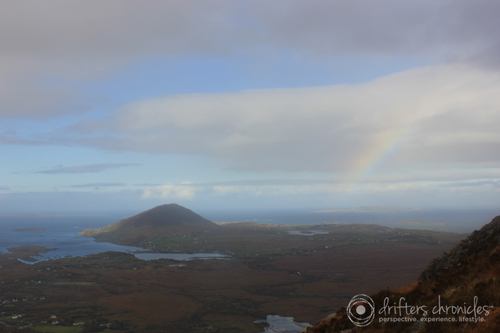 Connemara is picturesque, the green land , blue water. Nature is beautiful. 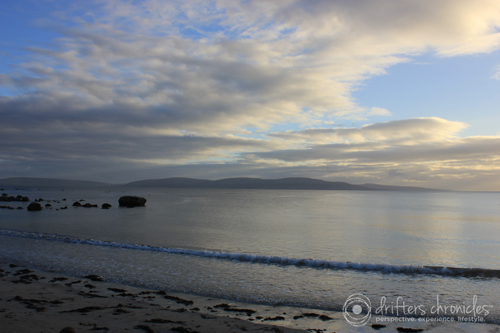 Back down the mountain, jumped back in the car and drove down the west coast back to Galway. We were by the ocean most of the way back and stopped to take a picture. Sun shining through the clouds, dark water and rolling waves –mesmerizing. 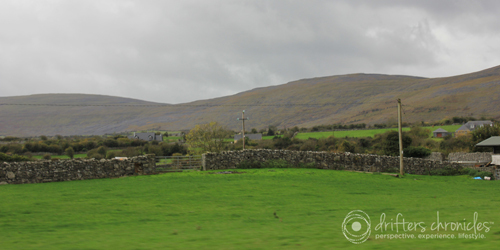 We left… back to Galway, and on a bus back to Dublin. 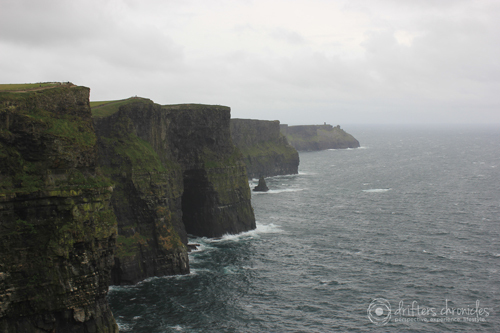 This entry was posted in Europe, Experience, Hers, Ireland, Lifestyle, Nature, Perspective and tagged Cliffs of Moher, Connemara, Connemara National Park, Galway, West Coast of Ireland. Bookmark the permalink.